The Boy Scouts had a big impact on youth’s life in America. 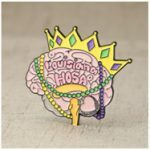 As the largest private youth organizations in the United States, founded in 1910, Boy Scouts of America (BSA) is committed to provide many Learning for Life programs to the kids, youth and even adults, help them prepare for life well, and earn their deserved custom coins in childhood. 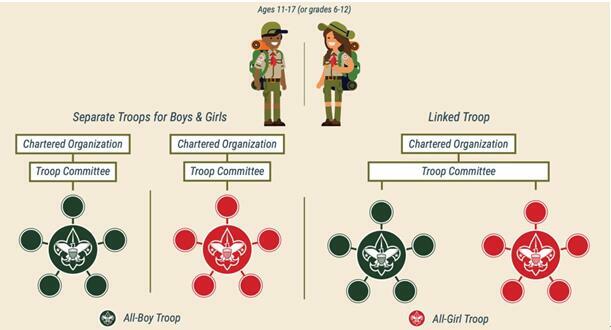 Scouting experience is divided into five programs according to age and activities, including Cub Scouting (Youth grades K–5), Boy Scouting (Youth 11–17 years old), and Venturing (Co-ed 14–20 years old), Sea Scouting (Co-ed 14–20 years old) and Exploring (Co-ed 10–20 years old). The traditional Scouting programs are preparing kids and youth to make keep them physically strong, mentally awake and morally straight over their lifetimes, by developing their character and skills for life. Now, it’s a new era for the Boy Scouts of America, it’s not the previous one, and try to reflect that inclusion throughout all of their programs, and the BSA makes great policy change as the below. 1.Girls can join Cub Scouting, Boy Scouting. These two programs are ready to welcome girls into program with open arms now. Cub Scouts is full of fun, and now it’s open to all kids. Both Cub Scouting and Boy Scouting programs with change to accommodate girls, and girls even have opportunities to earn the highest rank honor of Eagle Scout. The program for youth ages 11 to 17 will become to be called “Scouts BSA”, rather than Boy Scouting starting February 2019, which is to be harmony with the admission of this program to girls. That’s a way to welcome girls into the program, and prove that the Boy Scouts of America is moving to a more gender-neutral organization. Be noticed and do not confused, the organization’s name will continue to be Boy Scouts of America. The organization was also announced a new program called “Scout Me In,” an activity that will include both boys and girls to be a part of the life-changing experience of Scouting for the first time. More interesting program to join for girls and boys, this is for you! Change will be hard sometimes, but without change, we can’t become a better one. We are all excited about the evolution and changes that the Boy Scouts of America, it is going through making the programs more open to kids and youth. It is important that all youth can see themselves in scouting in every way possible; anyone can be Scouts to join all the programs and campaigns. The landmark change will come nearly in the next year. Boys and girls who are members of Scouts BSA will be known as Scouts. Just as before, these Scouts will earn merit badges, Hornaday medal, BSA challenge coins and even the Eagle Scout Award custom coins. It’s a wonderful way to encourage and recognize the excellence in units for their high-level performance, especial reward them with custom coins which feature the Boy Scouts of America Stylized Universal Emblem. 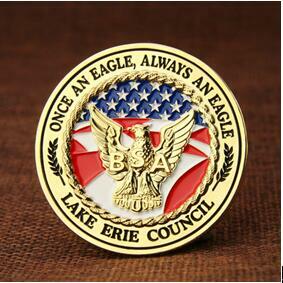 It’s always a tradition for all the Military, and challenge coin is the number one collectible for US Military units. 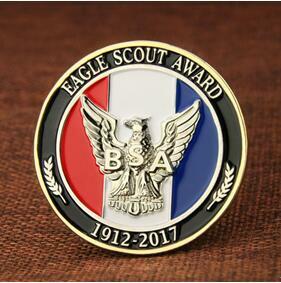 These Boy Scouts of America challenge coins are great gifts and honor that all Scouts never forget. As GS-JJ, custom coins can be created in variety of size, shape, and metal plating, feature your logo, name, and suitable for any groups, private organization etc. Custom coins are among the highest recognition and most collectible items available. Email us at info@gs-jj.com to start the free quote and designing process, or you can call us at 1-888-864-4755. 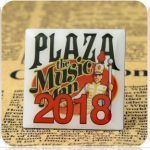 ← Why choose offset printed pins?